iWorkZone has a nearly 100% renewal rate with our valued partners. In addition to the ROI enjoyed from our incredible tools, the secret is in our service. If you have ever bought a software product and been left to survive on your own, you will appreciate the award-winning service we provide. Our Premium package is self-service with consistent support in the form of live specialists, timely email response, instructional webinars and online user guide/ FAQ’s. 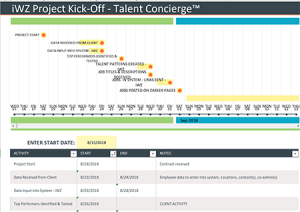 Our Talent Concierge™ package provides guidance and assistance to you in your processes. Your dedicated Talent Concierge will act as an accountability partner for your administrator while monitoring activity and doing the setup and ongoing maintenance for your jobs. Reardless of the level of package that is right for you, we guarantee we will provide the best service in the industry. Our service is our signature and our promise is your satisfaction. Deployment with iWZ is Easy! Learn about the Talent Selfie™ or Talent Pattern Matching. Ask us for a demo or take our survey!